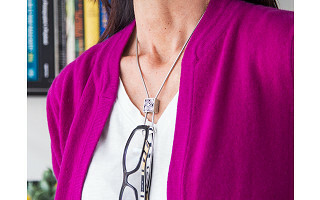 This glasses chain understands the perils of wearing specs—and solves them beautifully. Its lovely stainless steel design securely holds your eyewear in place. Makers Diana Wright and Laura Duprey wanted SpexSlide to look great even when it wasn’t holding glasses. And they succeeded, with an adjustable design that lets you customize the chain’s length to your liking. It keeps a secure grip on your glasses, too, which you can let hang or release by pressing the button. No more worrying about dropped, misplaced, or crushed eyeglasses. This solution keeps them secure and accessible, while keeping you nicely accessorized. Hey Grommeteers! I'm proud to introduce SpexSlide to The Grommet. I'd be happy to answer any questions you have! Question: Do you plan to come out with a gold-tone one? My name is Jacqueline and I was actually going to ask the same question, Margaret. "Great minds.."
I agree 100% having it in gold tone. @Dixie Hi Dixie, The chain length is 36 in. @Marcia but adjustable lengths correct? @Patricia thanks for asking the pendant slides to adjust to where you like it but no, the overall length is not adjustable, it is 36 inches. I'm a guy. Any plans for us? I'm not at all averse to wearing something around my neck, but it needs to look Yurman. Here's another guy who'd like to see something for men. Perhaps something in leather with a wood or wood-faced mechanism? @Johne we are working on a more masculine version so stay tuned! Great product. Think of different versions/sytles. Especially for MEN! @John we are thrilled that men like it and we are working on a version that would appeal to men! Any chance of doing designs in sterling silver? @Pamela we would consider doing that if there was enough demand for it, thanks for asking! I would like to see it in kid size. My daughter never has anywhere to put her glasses so she always gives them to me.